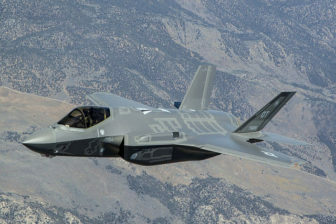 Washington – Under pressure from President Donald Trump to cut the cost of the F-35 program, the Pentagon and Lockheed Martin announced Friday they had reached agreement to lower the cost on the 10th lot of fighter jets by $728 million. “President Trump’s personal involvement in the F-35 program accelerated the negotiations and sharpened our focus on driving down the price,” Lockheed Martin said in a statement. The engines that power the stealthy fighter jet are made by Pratt & Whitney. The agreement, worth $8.5 billion for 90 Joint Strike Fighters, would bring the cost of the F-35 to its lowest point ever. For the first time, the F-35A, the model used by the Air Force, would cost less than $95 million. Under the deal, the price for an F-35B, a vertical-landing version specially designed for the Marine Corps, would be $122.8 million, and the F35C that will land on the Navy’s aircraft carriers will cost $121.8 million. In December Trump said the cost of the F-35 was “out of control.” Earlier this month, he boasted of “the massive cost reductions I have negotiated on military purchases,” and said he had extracted general promises to cut costs on the F-35 and on Boeing’s new Air Force One after meetings with the chief executive officers of Lockheed Martin and Boeing. Last week, U.S. Defense Secretary James Mattis ordered reviews of the F-35 Joint Strike Fighter and Air Force One after meeting with the president. Of the 90 jets commissioned under the contract, 55 would go to the U.S. military and the remaining 35 to international partners and foreign military customers, the Pentagon said. The Pentagon hopes to increase the number of F-35s it purchases in fiscal year 2018 to 70 from 63 this year. That number would grow to 80 in fiscal 2019, under the Pentagon’s plan, which must be approved by Congress. Sens. Richard Blumenthal and Chris Murphy and Reps. Rosa DeLauro, D-3rd District; John Larson, D-1st District; and Joe Courtney, D-2nd District, issued a joint statement praising the agreement.